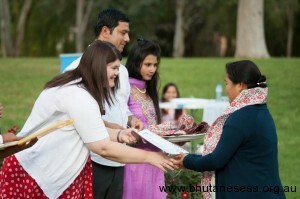 Bhutanese resettled in South Australia celebrated their fifth year of settlement at Fremont Park in City of Playford on 11th May 2013. The event kicked off with National Anthem and cultural presentation along with honouring 99 volunteers from within and outside the community who has directly contributed in the settlement of the Bhutanese in South Australia. BAASA also honoured City of Playford, City of Salisbury, City of Port Adelaide Enfield, Australian Refugee Association, Migrant Resources Centre of South Australia, Society of Torture and Trauma Assistance and Rehabilitation Service (STTARS), Lutheran Community Care, Anglicare SA, Northern Volunteers, Radio Adelaide, Multicultural Youth SA, Twelve25 Youth Enterprise Centre, St. Vincent De Paul Society, Multicultural Communities Council SA, Baptist Care and Migrant Health Services for playing a pivotal role in settlement and integration of Bhutanese in South since 2008. South Australian parliamentarian Zoe Bettison has expressed happiness over the progress Bhutanese, resettled in South Australia, are making so far. She also announced a grant of AUSD 3000 to support Bhutanese soccer tournament to be held in July. She added, “You have overcome your fears and apprehensions by sharing the challenges and opportunities faced when settling into a new country, and you have done this by becoming part of our community. She appreciated the culture of volunteering in the community. Mayor of City of Playford Glens Docherty said, “While becoming an Australian citizen is a wonderful thing, we also appreciate the need and desire to retain your sense of identity and your continuation of your cultural practices and values and I note the contribution that the Bhutanese Australian Association of South Australia is making in this regard. Mayor Docherty reminded Bhutanese who were soon becoming Australian citizen to preserve cultural identity to enrich Australian multiculturalism. Many support groups within the community such as Yuba Sansar, Bhutanese Youth Group, Namaste Cultural Group, Adelaide Dragon Soccer Club, Bhutanese Ethnic School, Bhutanese Seniors and independent volunteers supported the event. The event was organised by Bhutanese Australian Association of South Australia (BAASA)and funded by Playford Community Development Grants.